A good quality tripod is a must for fireworks photography. 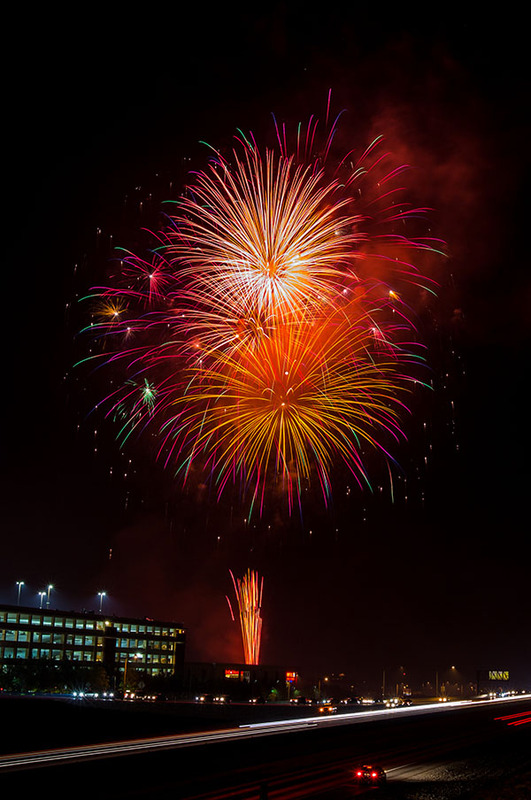 The beauty of fireworks photography is in capturing the light trail or blur of the fireworks. To achieve that a long shutter speed (4-10 sec) is required. To keep the camera totally still & shake free for that long exposure a tripod will be very useful. Bulb mode is the best for fireworks photography. So, a remote release would also be very useful. However, if you don’t have a tripod with you, you can make do with something sturdy that you can brace the camera on. You will be shooting from a good distance from the actual fireworks display so you shouldn’t have much trouble finding something sturdy. The top of your car, or any other car, a steel railing or a fallen tree will do. Anything sturdy that you can use will do. Best setting for fireworks photography is “Bulb”. To catch motion blur of fireworks 4-10 sec long shutter speed produces the best result. For that “bulb” setting & a remote provides more control. Well, if you don’t have a remote or cable release use your camera’s self timer. Once you’ve taken the first shot, take a short moment to analyze the photo so you can adjust your settings accordingly. You will most likely have taken quite a number of shots on your first try so you can capture the burst and not just the rocket going up. Quickly move to the frame where you captured the burst and analyze it. Avoid too many burst in a single frame. Early part of the display is the best for shooting fireworks. Later the sky becomes cloudy & hazy.